The basic idea of The Christmas Journey is to tell the Christmas story in a multimedia and hands-on way, enabling children to experience familiar (sometimes!) stories in a thought-provoking way. Children are encouraged to form links between Christmas and other Bible stories, particularly Creation and Easter. Our journey was planned to coincide with a town Christmas Festival in Frodsham. This enabled us not only to invite local schools, but also to become an attraction as part of the festival. In 2004, nine local schools attended the journey over two days. Many children returned, bringing their families and other visitors joined in the open sessions. Our target age group is Year 2 (6 - 7 years) as we plan to do this on an annual basis. However, it is enjoyed by both adults and children of all ages. Christmas Journey has returned to Frodsham each year since 2004. 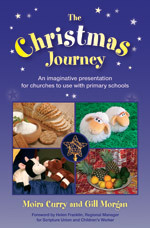 Resources section especially relevant for those thinking of staging The Christmas Journey or looking for downloads mentioned in The Christmas Journey by Moira Curry and Gill Morgan, ISBN 9781841016214, published 2009 by BRF, the Bible Reading Fellowship. If you put on Christmas Journey we would be delighted to hear from you and to add our prayers to yours, just drop us an email. At the bottom of each page is a link that leads to the next. The Christmas Journey logo on any page will bring you back to this page. This page was last changed on $Date: 2009/11/29 14:54:35 $.